ORLANDO, Fla. — From “curing cancer” to “becoming a pilot” to “overcoming fears,” every child has dreams. And with the help of Walt Disney World Resort, Steve Harvey and Essence magazine, many of them also have a platform to help them achieve those dreams. On Thursday, 100 high school students, ages 13 to 19, from all over the country found themselves experiencing a four-day, all-expenses-paid trip to Disney World for the 2018 Disney Dreamers Academy. Eleven years strong, the weekend is more than games and roller coasters, as Dreamers go through a series of power-packed workshops that give students the tools they need to reach their full potential. Since 2008, 1,000 Dreamers have done this work. The students are selected from thousands of applicants who answer a series of essay questions about their personal stories and dreams for the future. Per tradition, the weekend kicked off with a parade at the Magic Kingdom, followed by welcoming remarks from Tracey D. Powell, Disney Dreamers Academy’s executive champion and Walt Disney World’s vice president of Deluxe Resorts; author and talk show host Steve Harvey; award-winning gospel artist Yolanda Adams; Mikki Taylor, editor-at-large for Essence magazine; and George Kalogridis, president of the Walt Disney World Resort; Mickey Mouse; and Disney Dreamers Academy alums. The experience ends Sunday with a commencement ceremony. With a new #Be100 theme, Walt Disney World Resort is continuing its ongoing commitment to inspiring teens at a critical time in their development by providing a space to empower and encourage the Dreamers to relentlessly pursue their dreams. (Top-bottom, left-right) Mickey Mouse, Minnie Mouse, Steve Harvey, Tracey D. Powell, executive champion for Disney Dreamers Academy, and Mikki Taylor, editor-at-large for Essence magazine, star in a special parade Thursday at Magic Kingdom in Lake Buena Vista, Florida. 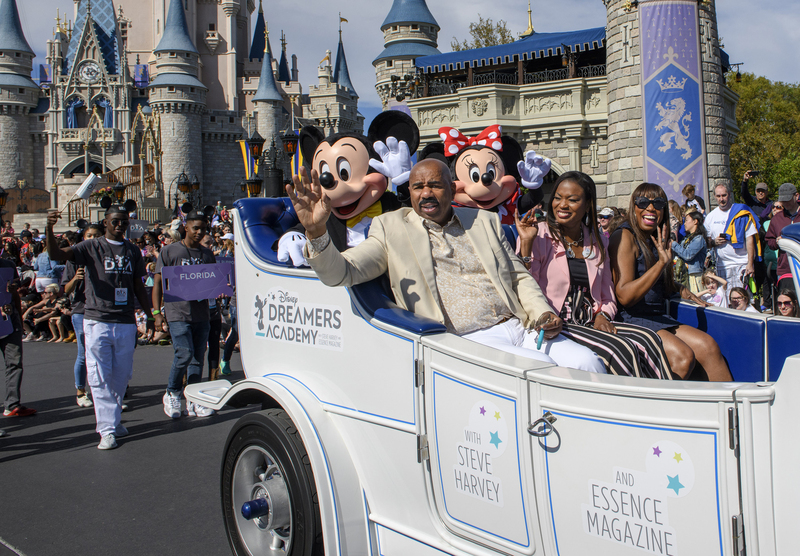 The parade signals the beginning of the 11th annual Disney Dreamers Academy with Steve Harvey and Essence magazine. The event, taking place March 8-11 at Walt Disney World Resort, is a career-inspiration program for distinguished high school students from across the United States. Parker — a minister and University of Southern California graduate, among his many accomplishments — learned through the program how to overcome his fear. He also attributed his success to the academy, which he said changed his mindset. “If you decide to Be100, your destiny will respond,” he said. Kalogridis voiced his thoughts about the academy and shared his favorite times at Disney. Powell said the academy is challenging the planners on how to build success from the past 10 years. The impressive résumés of students landed them the opportunity of a lifetime. Dreamers and their parents and/or chaperones all have different itineraries throughout the weekend, which gives the students a sense of independence. Dreamers will engage in a wide variety of experiences while working alongside some of today’s top celebrities, community and industry leaders and dedicated Disney cast members. Celebrity panels include educator Steve Perry; motivational speaker Alex Ellis; retired NFL great Emmitt Smith; artist, producer and songwriter Ne-Yo; actor and singer Jussie Smollett; actress Ruth Carter; actors Miles Brown and Marsai Martin (black-ish); and sisters China, Sierra and Lauryn McClain of the girl group McClain.